A mechanical engineering firm has gone into administration, with 35 people made redundant. 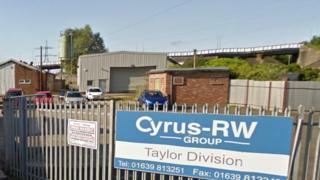 Cyrus-RW Group, which was set up in Cardiff in 1994 but now operates from a site in Briton Ferry, blamed "challenging trading conditions". There are 25 employees remaining on its books, with administrators looking for a buyer. The company once had sites in Durham, Glasgow and Aberdeen and in 2014 employed more than 120 people. Administrator Matt Haw said: "We are seeking a buyer for the business but sadly, the cash position of the company has meant that administration became unavoidable."